Wombie Travels: Hello San Diego! So! After spending a bit too much time drinking and playing Cards Against Humanity with my cousin, we headed to the Airport hotel at about 11.30. By the time we'd checked in and gotten settled for bed, it was 12.30. Setting the alarm for 4.30am kindly pointed out that we have 4 hours before we had to get up and check in to our flight. Super glad we decided to cough up the extra and stayed at the airport! The flight was uneventful, which is always good! We had a stopover at Minneapolis, kinda cool airport. 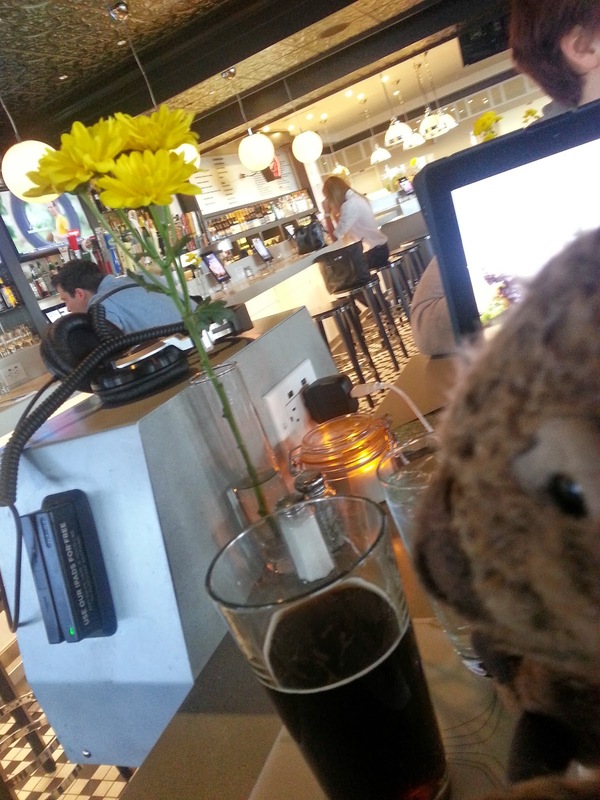 Wombie enjoyed his 9am-ish craft beer! This is a true story. The events depicted in this photo took place in Minnesota in 2014. At the request of the survivors, the names have been changed. Out of respect for the dead, the rest has been told exactly as it occurred. Because I don't have a phone on this trip, and we'd packed up our camera in the Car before it left Toronto, I haven't been able to take many photos. This was snapped on Erica's phone. I now have a camera so hopefully my future posts will be more visual! San Diego is gorgeous. Maybe it's just having a particularly "on" day, but it is just stunning. It feels welcoming, spotless and super colourful. It's definitely a car-centric city which I'm not a fan of but I can look past that, well, because we have a car! We spent the day in San Diego with Ian (Erica's Dad) and Jess (Erica's Sister). We started with the first restaurant we found with "Beer" in the title, great little craft beer bar... Unfortunately I was pretty jetlagged and out of it so I can't tell you where that was. We then headed to the hotel which looks a lot like the brochure... Not too much to say, for some naps. Dinner was great, we headed to Old Town where Cinco De Mayo celebrations were (unfortunately) beginning to close down for the weekend. We had some pretty OK Tacos at a pretty raucous Cantina with beer and Margaritas before heading back to the hotel. It's now 9.45pm San Diego time. Some math tells me that we've been up for about 20 and a half hours so it might just be bed time! I'm exhausted, excited and just super happy.